WASHINGTON – A powerful late-winter storm system mowed across six states late Tuesday and early Wednesday, spawning a series of tornadoes that reminded many of the deadly and costly outbreaks in the Midwest and Southeast last April and May. 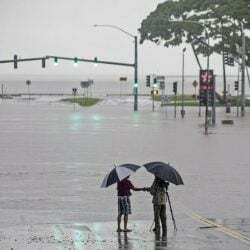 Climate experts cautioned that such conditions aren’t unusual this time of the year, and that warmer than average temperatures aren’t to blame. The most recent outbreak comes nowhere close to the devastation of last spring’s tornadoes, which killed more than 500 people. Over 24 hours, tornadoes touched down in Nebraska, Kansas, Missouri, Illinois and Kentucky, killing at least nine people, injuring dozens more and destroying homes and businesses. One tornado hit the country music resort town of Branson, Mo., where hotels and other businesses sustained damage. At least three people died in southwest Missouri. 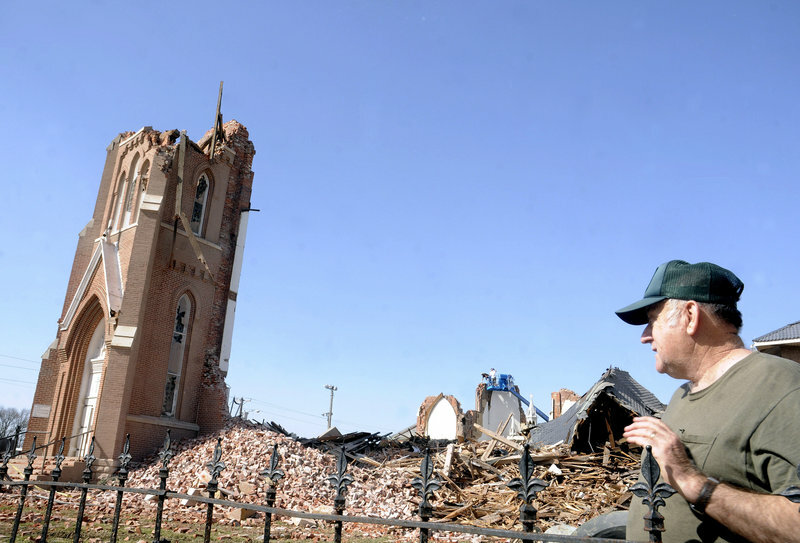 The hardest hit town was Harrisburg, Ill., about 100 miles southeast of St. Louis. At least six people were killed in the city of 9,000. The Category EF-4 tornado, the second-most powerful kind, which pack sustained winds of at least 166 mph, damaged or destroyed more than 300 homes and 25 businesses, according to the Saline County sheriff’s office. Tuesday night, a tornado touched down in Harveyville, Kan., southwest of Topeka, causing damage and injuries but no fatalities. A tornado touched down Wednesday near Elizabethtown, Ky., about 50 miles south of Louisville, but no fatalities were reported, according to the Kentucky State Police. The National Weather Service said a tornado touched down late Tuesday in western Nebraska, which had never recorded a tornado before in February. The Kansas tornado came with little warning, Watson said, touching down at about 9 p.m. Tuesday. While the storm damaged about 40 percent of the homes in Harveyville, she said, it couldn’t compare to the memorable 2007 tornado that flattened more than 90 percent of Greensburg and killed 11 people. In that tornado, she said, residents had 20 minutes to take shelter.